The Recommended Coach is a part of the UP and Running in Real Estate program.If you’re an independent coach, or looking to expand your coaching past your present clients, this may be an opportunity for you. There are ‘clients’ (agents) who register for this program who don’t have a designated coach, but would like to have one. That’s why Carla Cross has created the ‘recommended coach’ program. Note: All those who coach agents in the program must be Certified Coaches, but they don’t have to be Recommended Coaches.See The Recommended Coach for more details. First, register as a Certified Coach, and agree to the Certified Coach Guidelines. Sign up as an Up and Running in Real Estate Certified Coach here. A Recommended Coach logo for use in your signatures, website, etc. 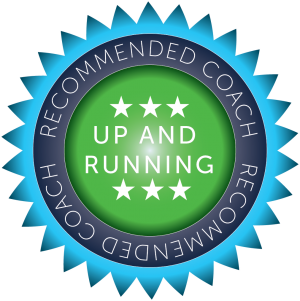 The Recommended Coach is a referral program. You will set your own fees, time frames, contracts, and operating procedures. Carla Cross will not collect any portion of the coaching fees you generate. After your initial Certified Coach $395 fee, and your $400 payment (due annually to be listed as a recommended coach), you will pay only $25 for each coaching client you register or gain access to through the site. Note: Your annual fee of $400 must be renewed yearly on your anniversary date to continue to be listed as a Recommended Coach.